Sugar Grove, West Virginia, is within the U.S. National Radio Quiet Zone (NRQZ), which also encompasses the Green Bank, WV area. 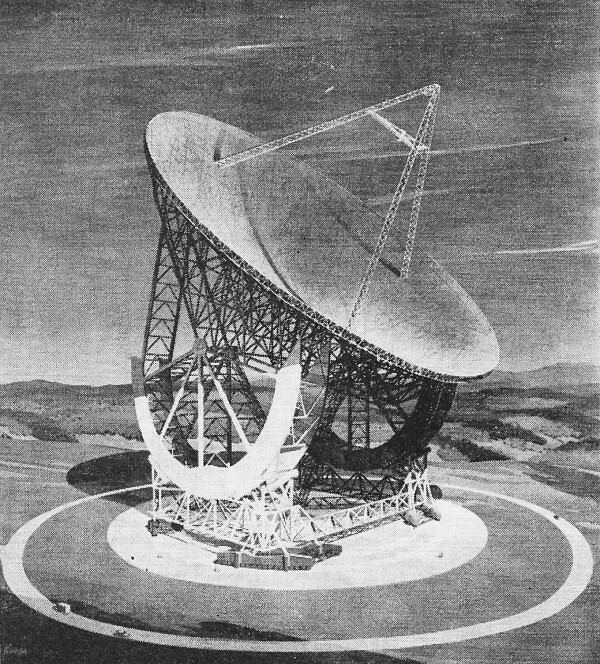 It was established by the Federal Communications Commission (FCC) in 1958 to protect hypersensitive, cryogenically cooled radio astronomy receivers from manmade terrestrial signal sources. As you can imagine, there are not many places remaining in human-inhabited regions of earth that are not massively invaded by radio frequency energy. If you visit the area today, you had better not have your cellphone, computer, or other RF-producing device turned on or you can be subject to a hefty fine. Roving signal detecting trucks monitor the region for offenders. This 1961 report on advances in electronics also features the world's first computerized bank check processing system, an underwater telecommunications cable handling system, and more. 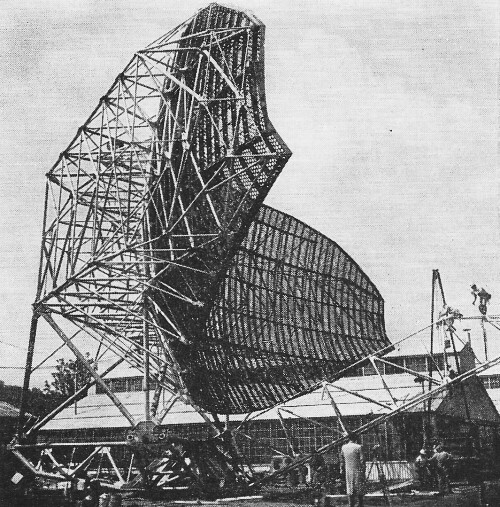 Artist's concept of world's largest radio telescope being erected by Navy at Sugar Grove, West Virginia. The $79-million facility is scheduled to be completed in 1962. It will enable scientists to tune in on radio signals emitted by astral bodies as far as 38 billion light years out in space, 19 times the distance probed by the 200-inch optical telescope at Mt. Palomar, California. Instrument's aluminum-mesh reflector will have a 600-foot diameter, dwarfing the 250-foot dish at Jodrell Bank in England, the largest radio telescope now in operation. 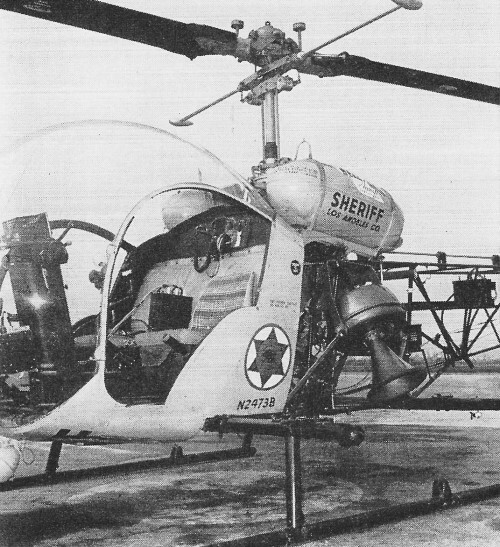 A new 400-watt amplifier, originally developed for the military by the Bogen-Presto Co., is being demonstrated below by means of a Los Angeles Sheriff's office helicopter. Designed for emergency rescue operations or general disaster work, the amplifier has an effective range of more than one mile and, by the use of transistors, weighs 75 per-cent less than equivalent equipment using vacuum tubes. Special University loudspeakers are employed in the system. The document handler at the left is a part of General Electric's new computer ERMA, now in use by Bank of America in Los Angeles and San Jose. ERMA is the world's first completely automatic operational banking system using magnetic character reading. In operation, magnetic tape heads read Arabic numbers printed directly on customer's checks by special magnetic ink. By the end of 1961 there will be 13 such computer centers in California handling two million checking accounts for 460 branches of the bank. 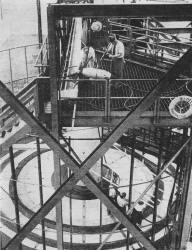 Simulated undersea cable-laying activities are shown on two levels of the cable ship "Fantastic" at Bell Telephone Laboratories' Chester, N. J. location. On deck, engineers place a cable repeater model in the "highway," ready for launching, while below others work out methods of stowing cable in the "tank." The cable-ship mockup will help engineers develop new shipboard equipment and methods of handling repeaters and cable systems. One of the largest radar antennas of its kind in the world (37 3/4 feet high and 125 feet wide) is being installed at Thomasville Aircraft Control and Warning Station in Alabama. Designed to search out and identify missiles and aircraft, the radar will become part of the U. S. Air Force's Continental Aircraft Control and Warning System. The installation's mammoth reflector antenna was built by Blaw-Knox Co. for Sperry Gyroscope Co. The Alabama project is part of contracts totaling $47-million awarded Sperry for development and production of high-powered air search radar systems. This bank of high-precision equipment lines one of two windowless trailers which provide Redstone Arsenal's Army Ballistic Missile Agency with a mobile means of testing the instrumentation designed to telemeter information from earth satellites and to "listen in" on the satellites once they are launched into space. 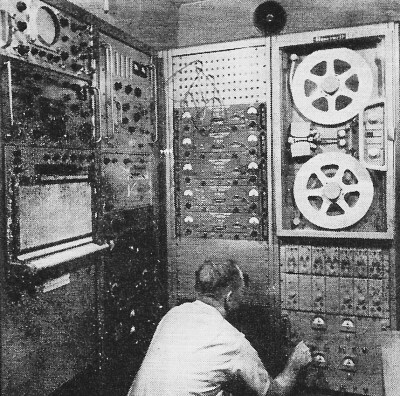 A Minneapolis-Honeywell recorder-reproducer (right) is used to record 6 channels of information on half-inch magnetic tape. 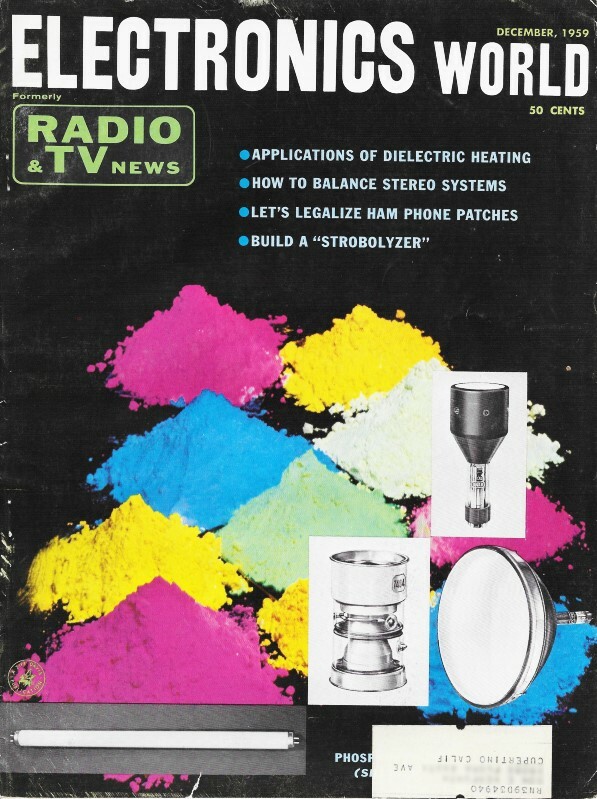 Pictured at the right is the unencapsulated electronics portion of the minified, transistorized Varian magnetometer which recently made the trip to outer space in a Vanguard satellite. The sensing head at the right encases a coil of wire immersed in hexane. The magnetometer, which weighs only 30 ounces without batteries, is used to measure the earth's magnetic field above and in the highly ionized upper atmosphere. 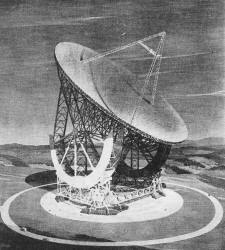 Findings are telemetered to ground stations throughout the world as the satellite continues in its orbit.